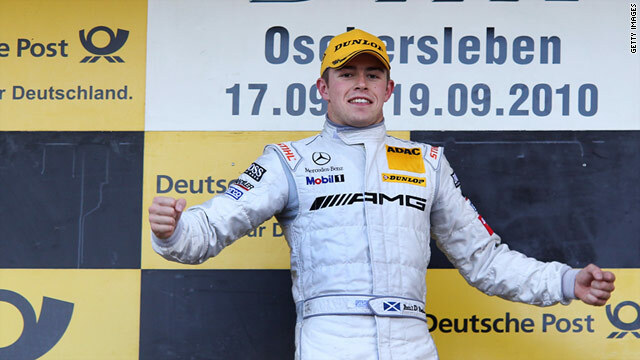 Di Resta has been handed his first F1 drive following his success in the German Touring Car Championship. (CNN) -- Formula One team Force India have confirmed that Scotsman Paul di Resta has been handed a drive, alongside Adrian Sutil, for the 2011 season. Force India confirmed the news at a press conference at the Glasgow headquarters of whisky company Whyte & Mackay -- one of the team's main sponsors. The 24-year-old, who was drafted in as Force India's test driver last season and took part in several morning Friday practice sessions ahead of grand prix races, replaces Vitantonio Liuzzi -- who joined the team late in 2009 as a replacement for Giancarlo Fisichella, after his fellow-Italian switched to Ferrari. However, Liuzzi disappointed last season and trailed German Sutil, who finished a creditable 11th in the driver standings last season with 47 points. Di Resta, who won the prestigious German Touring Car Championship (DTM) series last season, will be the third British driver on the grid, joining former world champions Lewis Hamilton and Jenson Button. Speaking on the team's official website, di Resta said: "Naturally I am thrilled to be making my race debut this season. "Becoming an F1 driver has been a long-held ambition of mine, something I've wanted to do since I first stepped into a kart, and to finally realise it feels amazing. "I've worked really hard for this opportunity throughout my career and to get it with Force India, a young team that's got ambitions as big as mine, is genuinely exciting. I can't wait to be on the grid in Bahrain, it can't come soon enough." As well as confirming the signings of di Resta and Sutil -- who will be starting his fourth year with the team -- Force India also revealed that former Williams driver Nico Hulkenberg has been recruited as their test driver for 2011.